The global final of the world’s biggest bartender competition is fast approaching and last night at a prestigious semi-final event in Miami, Marc McArthur of Norwegian Cruise Line captivated a judging panel of leading industry experts to be crowned the best cruise line bartender in the world. The next dock for Marc, 28, from South Africa, is the global final of one of the leading and most respected bartender competitions in the world – WORLD CLASS Bartender of the Year in Mexico City on 20th – 24th August 2017. Here he will represent cruise lines and battle it out against 56 of the world’s best bartenders for the coveted ‘WORLD CLASS Bartender of the Year’ title. Last year’s winner, Jennifer Le Nechet from France has experienced a life-changing journey and now enjoys travelling the world, judging the finals of top bartender competitions. Jennifer was part of last night’s judging panel and witnessed Marc’s talent and originality. 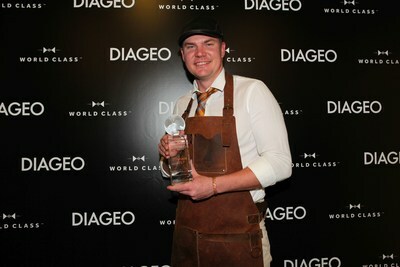 Marc saw off competition from talented cruise line bartenders from three of the world’s top cruise lines during a series of heats, before the final three contenders mixed it up in the deluxe Diageo 396 Bar in Miami last night. Jennifer Le Nechet judged the proceedings along with fellow industry elites; Enrique De Colsa, Master Distiller of TEQUILA DON JULIO and Ben Potts, one of Miami’s finest bartenders. It wasn’t just down to taste; the judges observed the semi-finalists’ creativity, knowledge, showmanship and the overall delivered drinking experience. Marc fascinated the judges throughout the ‘Mystery Box Challenge’ and ‘Cocktails Against the Clock Challenge’, mixing up unique cocktails with outstanding product from the DIAGEO RESERVE collection. Please drink responsibly, visit DRINKiQ.com.